Many people all over the world are so used to seeing flags that they often do not stop to think what purpose these flags serve. Why are they important? What is the reason behind the colors or their designs? Flags are not mere decorations. They serve as symbols of a country, a company or organization, or a group. Millions of flags are hoisted day in and day out mostly in schools, government offices and military installations all over the world. Flags have been flying for thousands of years and it’s about time to recall what they are here for. Basically, a flag is any measure of fabric used as an emblem, symbol, standard or identification. A flag can be used as decorations or in advertising. Flags also serve as signaling devices. They come in different shapes, colors, sizes and designs. The most common shape for a flag is rectangular. Designs of the flags around the world can be either simple or elaborate. Some are easy for school children to draw while others have complicated figures prominently displayed on them. The colors and the designs found on a flag have specific meanings for the people of the country that uses that flag. Flags can be hoisted, draped or folded. Different rules of etiquette apply in handling flags depending on the country or organization that owns the flag. Military regimens were among the first groups that used flags. Armies often marched into battlefields and into conquered lands with their standard swaying in the wind. The mere sight of an enemy's flag a good distance away could already bring fear into the hearts of their opponents especially if the opponents were weaker and outnumbered. Knights during the medieval period brought their own standard during battles as well as during competitions. Pirates used to fly black flags with white skulls and crossed bones on them. Seeing these pirate flags were enough to turn boats around in fear of the merciless plunderers of the sea. The color of the flag also sends a message. Waving a white flag means that one is surrendering. A white flag can also stand for peace. When you see a red flag, it may be a warning signal. A black flag on the other hand often means war. The position of the flag on the flagpole can also communicate a message. When a flag is flown half-mast or half-staff (halfway below the summit of the flagpole), it often symbolizes mourning for the dead, signals distress or shows respect. Military units used flags to communicate with their compatriots when other forms of communication devices and implements could not be used. Maritime groups used flags extensively as a means of getting messages across. This system of communication is referred to as semaphore flags. The word semaphore comes from two Ancient Greek words: sêma and phoros. Sêma means "sign" while phoros means either "bearing" or "bearer." In this manner of conveying information over a certain distance, signalmen commonly use hand-held flags. Sometimes, paddles, rods, disks or lighted wands are also used. The signalman stands with each hand carrying one square flag attached to a short pole. The signalman positions the flags in different directions depending on the letters or numbers that form the message he needs to get across. The information being communicated by the signalman is deduced by the receiver of the message on the other side based on the position of the flags. There are eight possible directions the signalman can point to. Each letter on the semaphore alphabet will depend on the position of the arms. The two flags should never overlap except when the signalman is at rest. Without the flags, this system of communication can still work using just the extended arms. However, by using flags, the message is more obvious especially if the distance between the signalman and the receiver of the message is quite far. The colors of the flags betray whether the signal is sent by land or by sea. The Papa flag, white and blue flags, are used on land. The Oscar flag, red and yellow flags, are used on sea. Today, semaphore flags are not as widely used due to advancements in technology. Marine rescue groups, police regimens, mountaineers and other groups still use visual communication systems similar to the semaphore but sometimes without the use of flags. Some scouting groups continue to teach flag semaphore to their young scouts. National flags of states and countries became more common during the later part of the 18th century. By the 19th century, all sovereign states had their own national flags. Today, each national flag has a story to tell of its inception, its maker, and when and where it was first hoisted. National flags are to be revered and respected. There are laws in each nation as to how their national flags are to be hoisted, handled, folded, and kept. Each national flag represents not only the country but it also represents its people. National flags are symbols of sovereignty and independence. They communicate freedom, pride and love for country. National flags are not mere pieces of fabric. Each one tells of a people's history, their culture and language. · Vexillology is the study of flags. · The flag of the United Kingdom is called the Union Flag or the Union Jack. Jack is not a name of a person. In nautical terms, the word "jack" refers to a small flag that usually indicates nationality and is flown at the front of the ship (bow). · Old Glory is the nickname of the flag of the United States of America. It is also called the Stars and Stripes or the Star Spangled Banner. · The pirates' black flag with the white skull and crossed bones is called the Jolly Roger. · Denmark's flag, the Dannebrog, is the world's oldest state flag that is still in use today. Dating as far back as the 13th century, this flag features a white cross. · The country of Netherlands has the oldest tri-color flag. It features a red, a white and a blue band. 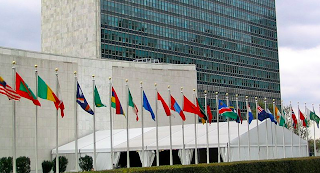 · South Sudan is the newest nation in the world, thus it has the newest flag in the world. The country celebrated its independence last July 9, 2011. · The Kingdom of Nepal's flag is very different from the rest of the flags because it is non-quadrilateral. It's shape? Two triangles one on top of the other. The triangles are referred to as pennons, which is the term used by vexillologist for pennants. · According to the Guinness Book of World Records, the largest flag in the world on a flagpole measured 34.3 meters by 60 meters. This was the Mexican national flag flown on December 2, 2011 in Piedras Negras City in Coahuila, Mexico. Last year, the record for the largest draped flag was given to a Lebanese flag that measured 325 meters (length) by 203 meters (width). Flags can send different messages like warning, surrender, truce, peace, war, sovereignty or plunder and pillage. They can communicate powerful messages that drive men into action. Whether brand new or tattered and frayed, flags have a way of stirring men's souls. Depending on the current mood or situation in a country, a person may feel extreme pride, great sorrow or overflowing hope for his country. A flag can inspire one to greatness and another to destruction. Learn more about national flags and the countries they represent. It's a great way to increase your knowledge of world history, culture, languages and current events. Becoming a recreational flag enthusiast will surely open up your mind about peoples in countries both near and far.